A five-year-old boy has died after a crash with a van. The child was riding a bicycle at the time of the collision in Knaphill, Surrey, police said. The van driver stopped at the scene near to the junction of Limecroft Road and Chobham Road at 16:10 GMT on Tuesday. 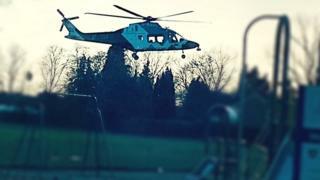 The boy, who lived locally, died in hospital with his next of kin present, Surrey Police said. No arrests have been made. He was in the reception class of nearby Knaphill Lower School and fellow pupils were being supported "throughout this difficult time", head teacher Jo Concannon said in a message to parents. "As a school community, I am sure that you will wish to join me, and my staff in offering our deepest condolences and sympathy to the family," she said. The air ambulance landed in nearby Sussex Road Recreation Ground but paramedics took the boy to Frimley Park Hospital by road, South East Coast Ambulance Service said. Will Forster, mayor of nearby Woking, tweeted: "My thoughts are with the child's family, can't imagine what awful evening they are having."